Taiwan : When and where to go? The subtropical climate is tempered by the presence of mountains that offer cool temperatures in summer, and snow between December and February. It is warmer and dry in the south-west in winter than in the northeast, where rains are very frequent. The best time to visit the country is in November, which will save you crowds, very high fares, and where you can still enjoy a pleasant climate. Tapei, its ultra-modern capital, the beaches and cliffs of the long coast of this astonishing island, its chain of mountains with high peaks, the small villages of the coast is more wild: the assets of Taiwan do not lack to make it An exciting tourist destination. If you start with Taipei, be prepared to be swept away in a whirlwind that never stops, even at night. Pressed crowd, exorbitant prices, cars, pollution, but also very good cuisine and very welcoming inhabitants make this city a must stop. Alishan is a resort located in the heart of the island: you can get there by bus or train to admire the sea of ​​clouds seen from Mount Chuschan after a hike at dawn, followed by a walk of ten Of kilometers in the steam train to Monkey Rock, unless your mountaineering skills allow you to attempt the ascent of Mount Yushan, to almost 4000 meters, the highest in Taiwan. Anyway, avoid Alishan on weekends, when tourists abound. Do not miss the gorges of Taroko, very close to Tienhsiang, station perched above these gorges and from where you can leave for many excursions. Cascades falling in the water of the river, cliffs with dizzying peaks, hot springs, superb landscapes punctuate the twenty kilometers on which take place the gorges. Temporary lovers will surely visit Tainan, in the south-west of the island, which has a very large number. You can attend Buddhist ceremonies, but also discover beautiful buildings such as the Kuanyin statue of the Mito temple or the pagodas surrounding the Kalyuan temple. One can also see in the city the Great South Gate which testifies of the presence of the ancient ramparts. Also worth seeing are the volcanic island of Lanyu populated by Yami aborigines and their underground houses, the village of Maolin encircled by wild mountains, the hot springs of Tona, the Penghu islands and their sandy beaches lined with turquoise water . A visa is only required for a stay of more than 3 months, otherwise a passport is sufficient and a return ticket. The current currency is the new Taiwan Dollar (TWD). 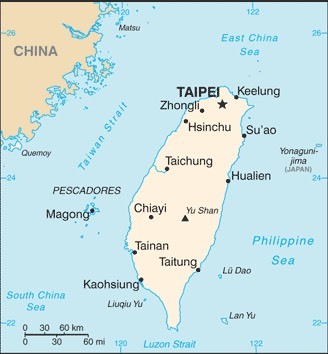 By plane, you will land at Tapei (Taiwan Taoyuan airport) or at Kaohsiung. To travel around the country, you can rent a bike for small trips if you are traveling in rural areas. Buses are a convenient and safe means of transport, well developed throughout the country, especially in tourist areas. Renting a car can also be an excellent solution for some less-than-ideal trips. For the coasts, the train is very efficient and its network well extended. All budgets are possible in Taiwan, depending on the level of comfort required: dormitory or hotel, street stalls or restaurant, bus or car rental, you can spend from single to triple. Allow at least 60 € per day for one person if you choose the least expensive services. Health: The country's health system is well developed. In addition to traditional vaccinations, it is recommended to have those against typhoid and hepatitis A. Protect yourself also against mosquitoes. Note: there is a high pollution in the cities. Security: Risks are mainly related to natural disasters, floods, typhoons, earthquakes. The streets in town are safe, even at night, even for single women. Shopping: You will not be surprised when you talk about cheap electronics and computers, but you can also find designer clothes in the night markets. Handicrafts, porcelain and ceramics are cheap, as well as rattan items and jade jewelry. Other interesting ideas: paper umbrellas and tea, one of the best in the world.